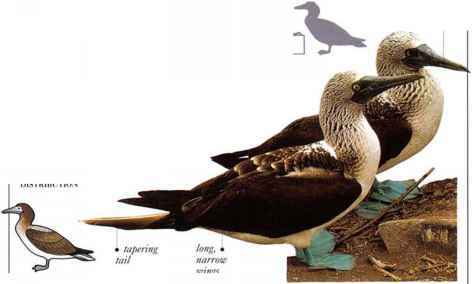 A coastal seabird that plunge-dives for fish, this bird resembles a gannet but is more lightly built and has a longer tail. These features enable it to dive into shallow water. Flocks sometimes plunge simultaneously from a height. The birds nest on offshore islands in small colonies. In courtship, they display their blue feet, which also provide warmth for incubation. • NEST Eggs are placed on flat ground, usually with no nest materials. The two crests crossing the head of this large, dark cormorant are normally barely visible, raised only for short periods when the birds display. The Double-crested Cormorant is found as often on rivers and freshwater lakes as on the coast. It swims characteristically low in the water and dives in pursuit of fish, propelling itself with its large, webbed feet. Nest colonies are found either on the coast or beside large inland waters. 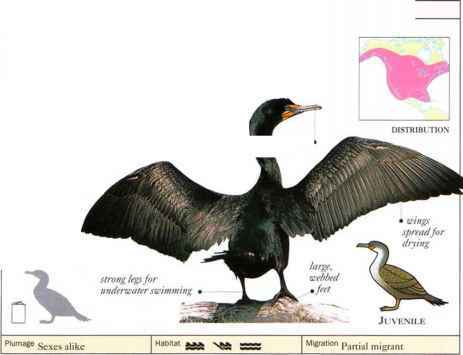 This large cormorant is found on any large stretch of water in its worldwide distribution, including lakes, rivers, estuaries, and coastal waters. To feed, it swims low in the water, often peering under the surface to locate fish, and dives to pursue its prey, l-'ish are brought to the surface to be gulped down in the cormorant's wide gullet. Like other cormorants, this species has poorly waterproofed plumage and is often seen standing with its wings spread out to dry. In the air, it travels in steady, flapping flight with occasional glides. 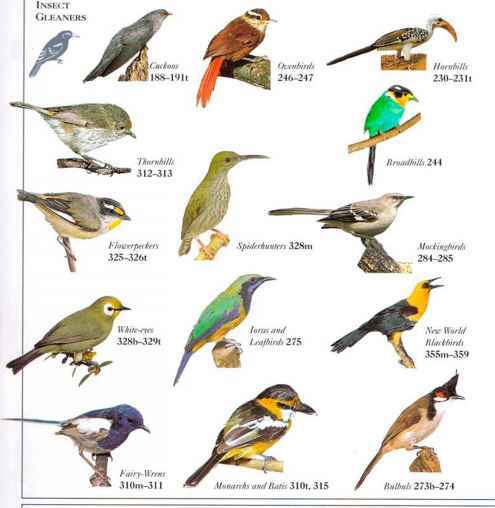 When breeding, birds have white patches on the flanks and head and a glossy sheen on the dark plumage. • NEST A bulky, cup-shaped nest made of seaweed and debris, placed 011 a flat rock or cliff ledge; or a stick nest in a tree. America; much of Eurasia; parts of Africa; S. and S.E. Asia: parts of Australia.